BETHESDA, MD--(Marketwire - Oct 31, 2012) - As the holiday season approaches, sugar plums aren't the only things dancing through people's heads -- there are also "SALE" signs in just about every window. This is especially true at the many shops and stylish boutiques of Bethesda Row in Maryland. And throughout the holiday season, Bethesda North Marriott Hotel & Conference Center is proud to offer convenient accommodations for holiday shopping sprees. Catering to those who appreciate "retail therapy," Bethesda Row delivers "...whatever your heart desires... from fine cookware to fine art, high fashion to high-tech gadgets, workout gear to sparkling gems." This unique shopping center offers a mix of residential, spas, event space, open-air boutiques and shops that's far from ordinary, including some of the best restaurants in the area. Bethesda Row can be explored online at http://bethesdarow.com/shop/. After a long day -- or weekend -- of shopping bliss, guests can settle in and relax at Bethesda North Marriott. Newly renovated and one of the premier hotels in Bethesda, MD, Bethesda North Marriott Hotel & Conference Center features 447 guest rooms and approximately 50,000 square feet of event space adjacent to the area's Metro system. Information on reservations, including Last-Minute Weekend rates, can be found at http://www.marriott.com/hotels/hotel-deals/wasbn-bethesda-north-marriott-hotel-and-conference-center/. This spacious and stylish hotel near Chevy Chase, MD also offers easy access to Rockville, MD, Washington, DC and Northern Virginia. With a 23,700 sq. ft. ballroom, a 120-seat amphitheater, innovative catering menus, and impeccable hotel rooms and amenities, this conference center and hotel in Bethesda, MD is the perfect union of form and function, capable of hosting a variety of events -- from meetings and conferences to wedding receptions. All of this Bethesda, MD hotel's guest rooms and suites feature high-speed Internet access and upgraded Marriott Revive bedding, allowing guests to experience maximum ease and efficiency. This Bethesda hotel near Metro is just a short ride from Smithsonian museums and DC organizations; convenient for both work and play. Shop and stay in high style with Bethesda North Marriott Hotel & Conference Center. 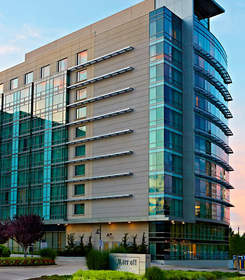 Bethesda North Marriott Hotel & Conference Center is the premier conference hotel in Rockville, MD. Spacious and convenient, the hotel is also home to two on-site restaurants, Meritage and On The Rocks. With 436 guest rooms and 11 suites on 10 floors, this Bethesda, Maryland hotel also features approximately 50,000 square feet of state-of-the-art event space, providing the perfect setting for events of any size including meetings, weddings, conferences and leisure travel. Throughout the holiday season, Bethesda North Marriott Hotel & Conference Center is proud to offer convenient accommodations for holiday shopping.